The world between digital SLR cameras and mirrorless cameras are getting smaller and smaller. This new Sony ILCE-3000K/A3000 is an example of a camera for people that like the SLR form factor, but don't want it be to big. I a little like the Canon EOS 100D. Sony ILCE takes the format factor from the alpha cameras and combines it with the technology of the NEX cameras. This might be the reason the Sony doesn't name it one way of the other as it really isn't a NEX camera as the form factor is that of a digital SLR and it really isn't an alpha camera as it has the technology and mount of a NEX camera, so there you have a new product line. The target user for the camera is the amateur user that wants to feel like they have a digital SLR camera. The camera doesn't have many buttons, so it should be easy to use for many of the users of the camera. So do the camera have any potential users? At that price level I am sure that there are many that wants to jump on the wagon and it is even cheaper than most of the NEX cameras. So you are getting a camera with NEX techonology at a good price as long as you don't mind getting a bigger camera body. And at a price of $400 with a lens this really a great deal. It should be interesting to see how this camera match up against both other digital SLR cameras and mirrorless cameras. 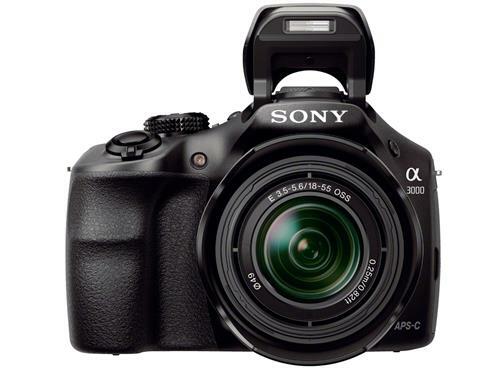 Follow the Sony ILCE-3000K/A3000 at Sony Index.